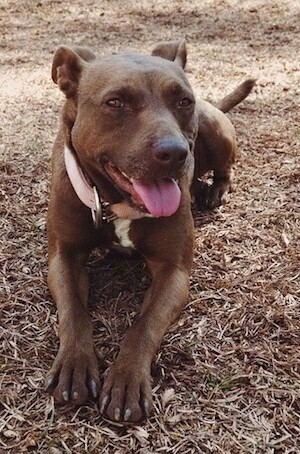 Lucy the Pocket Pitbull (Pitterdale) at 5 years old—"This is Lucy, my APBT x Patterdale or "Pocket Pit". 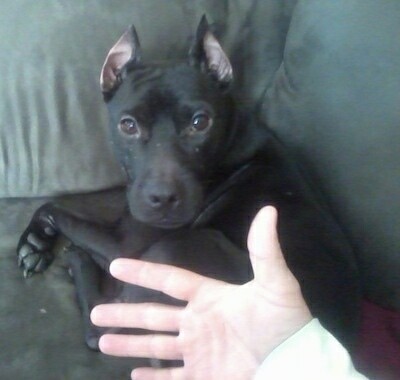 She basically looks like a very small game bred Pit Bull. She is extremely intelligent, very trainable, has an intense will to please, is very prey driven and has gameness for days. She is pretty dog reactive, will fight anything that looks at her wrong and hates other females. Not a mean bone in her body when it comes to people and she is crazy about children. 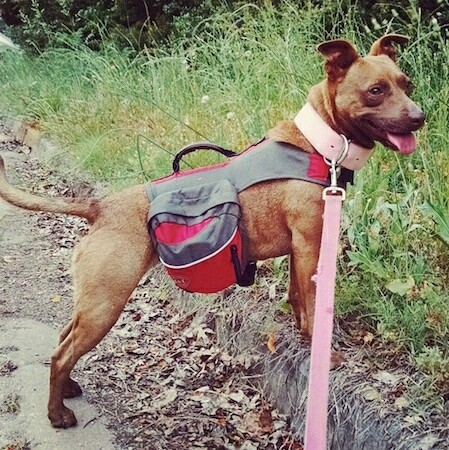 She's much more a working dog than a "pet", very high energy and driven, but with a lot of love, training and exercise she has become an excellent little house dog. In short, she is a total sweetheart with people and a little monster in every other way. 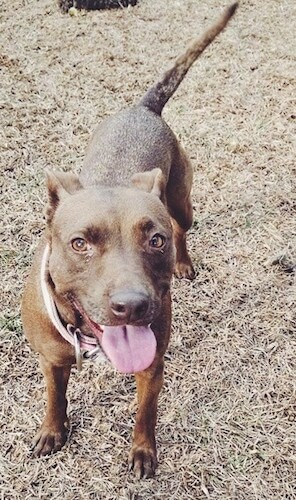 Pocket Pits aren't for everybody, but she is a wonderful little dog with a heart made of gold." Pocket Pitbull is not a purebred dog. 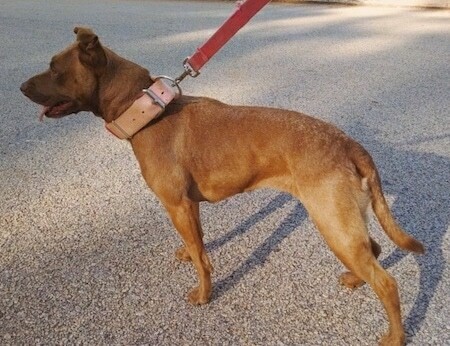 It is a cross between the Patterdale Terrier and the American Pit Bull Terrier. The best way to determine the temperament of a mixed breed is to look up all breeds in the cross and know you can get any combination of any of the characteristics found in either breed. Not all of these designer hybrid dogs being bred are 50% purebred to 50% purebred. It is very common for breeders to breed multi-generation crosses. 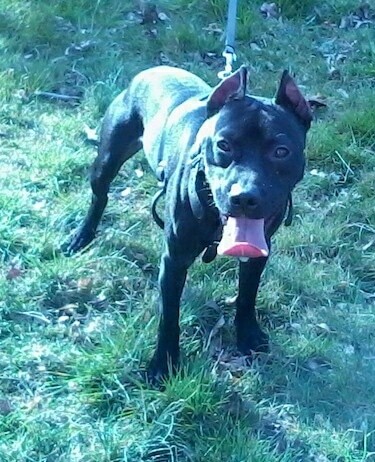 Mumphy the Pocketpit (Pitterdale) at 2 years old—"Mumphy in his stomping grounds. 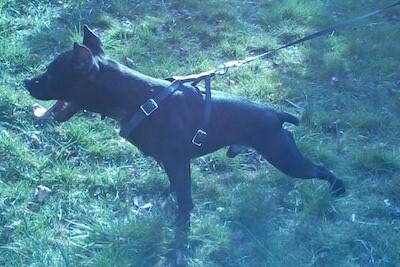 This breed, in my opinion is one of the smartest and obedient dogs I have ever had the pleasure to own. He is also a tough little guy so don't be fooled by his size. His mother is a 12-pound Patterdale. His father is a 38-pound Jeep RedBoy Rascal Pitbull." "Mumphy is a Pocketpit (Pitterdale). 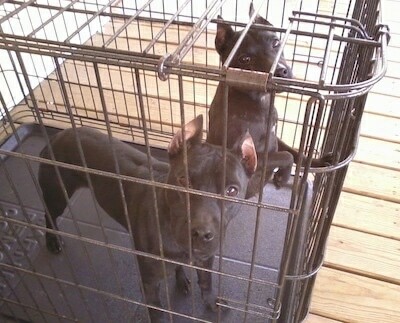 His mother is a 12-pound Patterdale. His father is a 38-pound Jeep RedBoy Rascal Pitbull. Mumphy is an amazing dog. He climbs trees and jumps over your head. He can hang off of a tire for two hours. He has the highest prey drive of any dog I have ever owned."